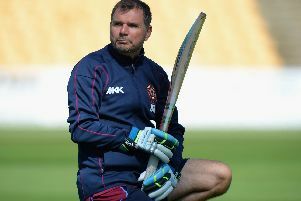 Northants are well placed to bag their second consecutive Specsavers County Championship Division Two win in Cardiff on Thursday, and move off the bottom of the table in the process. After outplaying Glamorgan on the third day at Sophia Gardens, David Ripley’s men need to take six wickets on the final day’s play on Thursday to make it back-to-back wins. Northants started the day in a good position, and once they had declared at 403 for nine, the home team were set the mammoth total of 434 to win. Glamorgan looked to be going okay, but two late wickets from Seekkuge Prasanna saw them close on 121 for four, with Australian dangerman Usman Kahawaja already out. It means Glamorgan’s chances of avoiding defeat are slim on a pitch where the odd ball is misbehaving for the seamers, and there was sufficient turn for Sri Lankan Prasanna. When play resumed on another glorious morning, Ben Duckett and Luke Procter extended their opening partnership to 208, and surpassed the previous record for that wicket against Glamorgan, established by Brian Reynolds and Mickey Norman at Northampton in 1962. Procter, who made an assured 70, was the first to go, when his inside edge off van Der Gugten was well caught by Cooke, and three overs later Duckett’s season best of 133 from154 balls which included 22 fours, ended when he miss-hit a short ball from Rory Smith to midwicket. The third wicket then fell for the addition then fell for only seven runs, when skipper Alex Wakely sliced a drive to second slip, and the Glamorgan bowlers’ efforts were rewarded further when Richard Levi and Adam Rossington perished in quick succession. But any hopes Glamorgan might have had of a further collapse were dashed by Ricardo Vasconelos and Steven Crook who extended Northants’ lead to more than 300, and shared a partnership of147 for the sixth wicket. Vascolenos, a 19-year-old South African left hander, who qualifies by owning a Portuguese passport, again made an impression in his first year with the club, after scoring 56 in the first innings. Most of his runs came through the offside, but when Hogan dropped short he pulled him over square leg for six. After scoring 76, Crook was bowled, heaving at Smith, who then had Vasconelos caught at slip for 79. The tail surrendered in their quest for quick runs, before Wakely declared two overs before tea. Glamorgan had 33 overs to face in the evening session, and after a promising start, were soon 54 for two. Nick Selman gave cover point a simple catch from Procter’s second ball, then Jack Murphy, shortly after being struck on the helmet, guided one from Nathan Buck to third slip. Kahwaja, in confident mood after his century in the first innings, began by striking four boundaries, and followed it up by taking two more fours from Buck’s third over. Owen Morgan was more circumspect, but played every ball on merit, and the third wicket pair soon shared a 50-run stand. But after scoring 38, Kahawaja was caught by Vasconelos at short leg, when the Australian struck the ball firmly off Prasanna, only to see the fielder the fielder juggle with it three times before eventually holding on. Prasanna then took his second wicket when Morgan’s push was deflected by first slip to second with Glamorgan almost dead and buried. Vasconelas was delighted with how the day went for him and Northants, but warned there is still work to do if the win is to be collected. “It was a great day for us and everything went to plan,” he said. “I had to fight hard for my runs and rode my luck at times.